ORGANIC AIR｜ORGANIC COTTON｜IKEUCHI ORGANIC Inc.
As light as the wind. You might not believe it until you feel for yourself. 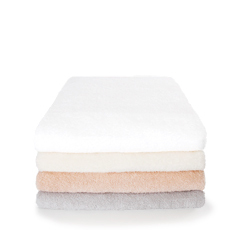 Thin and light enough for even a bath towel to be squeezed into two hands. But still tough enough to endure heavy use. Try it once, and you will be hooked forever. A 1m long bath towel weighs a mere 160g. A face towel feels like it weighs nothing at all. The only thing you notice is a soft sensation on the palm of your hand. 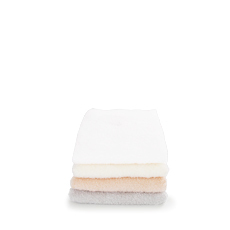 We promise an unprecedented sensation when you wrap yourself in our Organic Air towels. 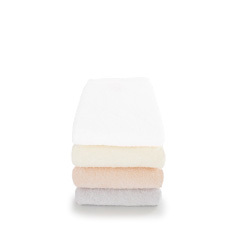 While astoundingly soft, it still wipes away moisture and doesn’t feel soggy. We guarantee a clean softness, always. Try wrapping yourself in Organic Air, like wearing the wind. Ultra light. After wiping your body, you forget it’s on your shoulders. We developed this towel to be ultimately light and easy to use. To weave towels with fine organic cotton yarn requires subtle and delicate technology. While the theory is not difficult, it took countless tries to get it right in practice. Experience gained through this trial and error lead to IKEUCHI ORGANIC technology that has significantly advanced the potential of organic cotton with the creation of Organic Air. This revolutionary towel is as light as the air, and still able to withstand hard use.